Discover the 24 reasons people are leaving you for competitors and how to win them back. In Why Customers Leave, popular customer experience and marketing speaker David Avrin makes a compelling case for customer experience as a bankable differentiator in an era of vast marketplace choices. 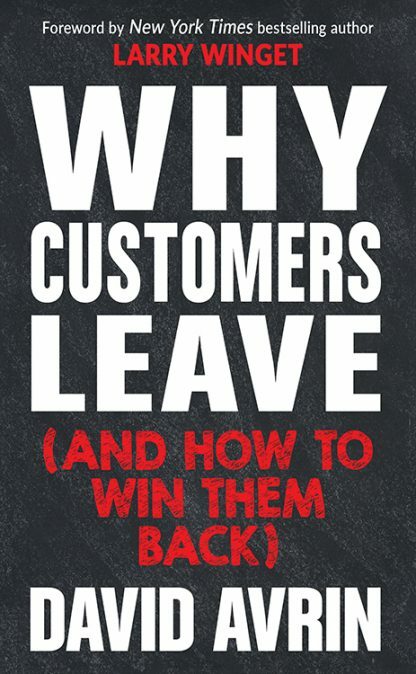 The book lays out the very visible reasons for the recent shift in customer mindset and expectation, illustrates the myriad ways that companies inadvertently drive customers and prospects to competitors, and offers a multitude of creative strategies and tactics to attract and retain new prospects. David Avrin, CSP has become one of the most popular speakers on customer experience and marketing in the world today. In recent years, David has presented for enthusiastic organizations and audiences in 22 countries on 6 continents including Singapore, Bangkok, Melbourne, Buenos Aires, Manila, Rotterdam, Bangalore, Sydney, London, Barcelona, Monte Carlo, Johannesburg, and Dubai. A former CEO group leader and an in-demand speaker for Vistage International, the world�s leading CEO member organization, David Avrin has had over 4,000 one-on-one conversations with company leaders regarding their value proposition and competitive advantages. David is the author of It�s Not Who You Know, It�s Who Knows You! and Visibility Marketing.